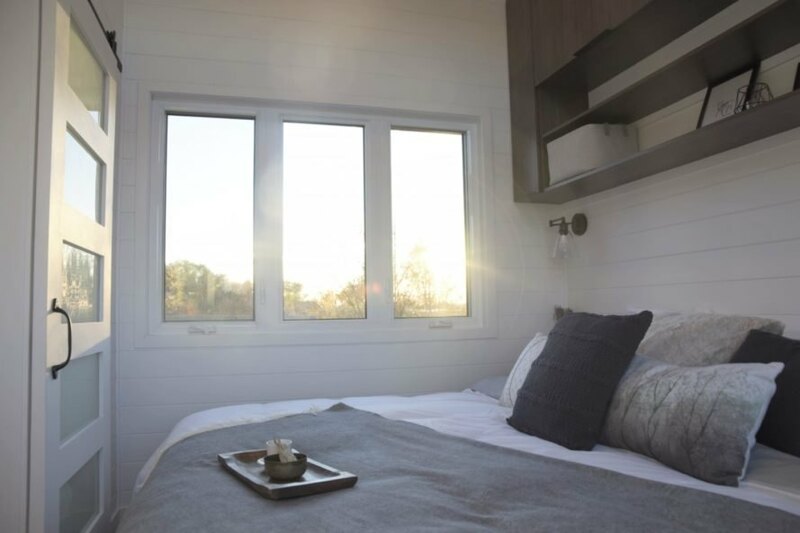 Canadian tiny home builders, Minimaliste Houses, know a thing or two about creating durable tiny homes that can stand up to extreme temperatures. 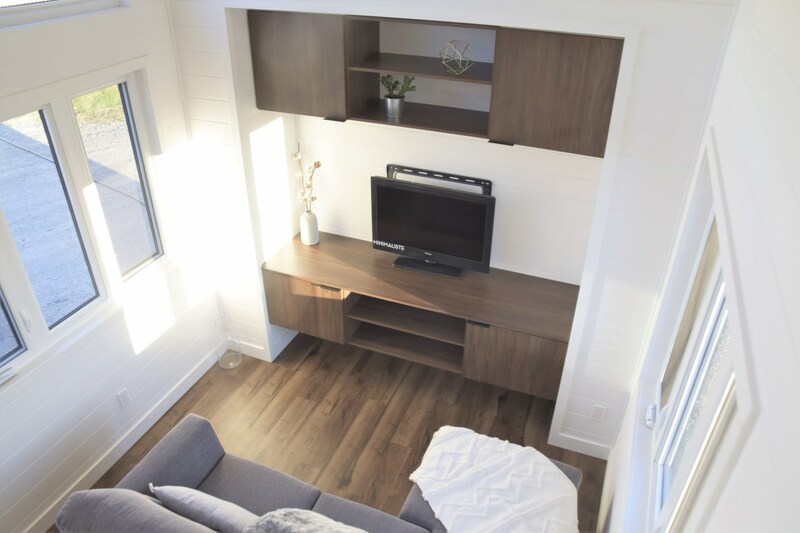 The designers are back with another stunning tiny home, the cedar-clad Magnolia. 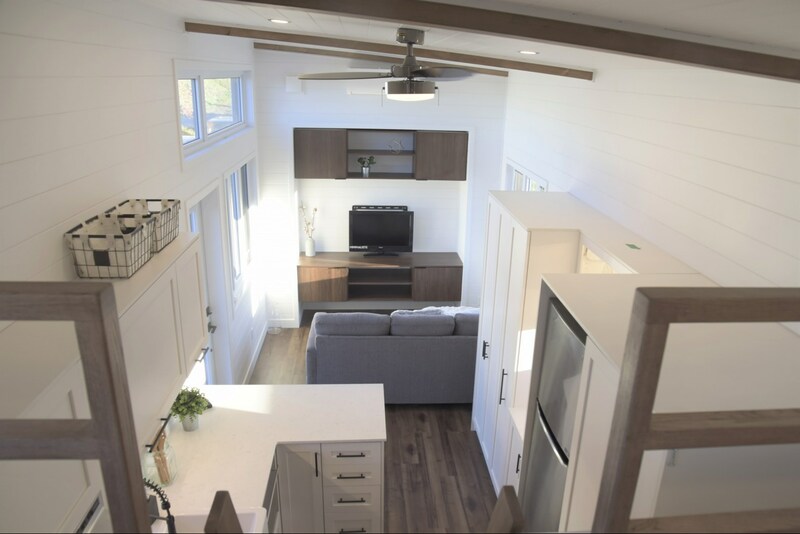 Built to withstand northern Ontario’s weather, the tiny home was designed to be energy-efficient thanks to tight thermal insulation and various sustainable features such as a composting toilet and LED lighting. 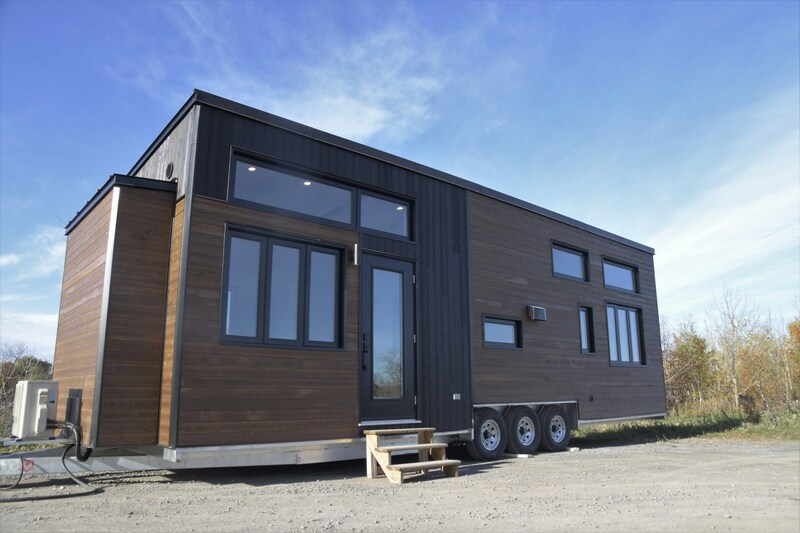 The exterior of the tiny home reflects most of the tiny home builders’ exteriors. 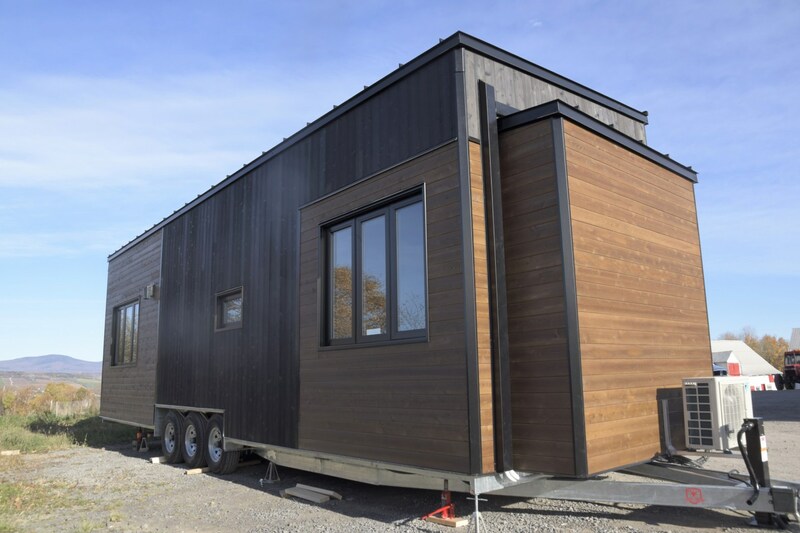 The 10.5 x 34.5 feet structure on wheels is clad with two-tone cedar panels with black steel accents. The black cedar panels were burnt using the Shou Sugi Ban technique, which creates a durable exterior that won’t fade over the years. Additionally, the dark and clear cedar gives the home a modern, yet rustic aesthetic. The sophisticated look of the design continues throughout the interior where a double-height ceiling painted in all white gives the space a bright, open feel. The living room is a surprisingly large spacious, furnished with a comfy sofa and entertainment center. At the clients’ request, the main bedroom is located on the first floor, but there is an additional sleeping loft installed over the bathroom that can be used as a guest room or storage space. The bathroom is also a fairly large design and was installed with a composting toilet. The kitchen in the Magnolia is a perfect space for the home chef. 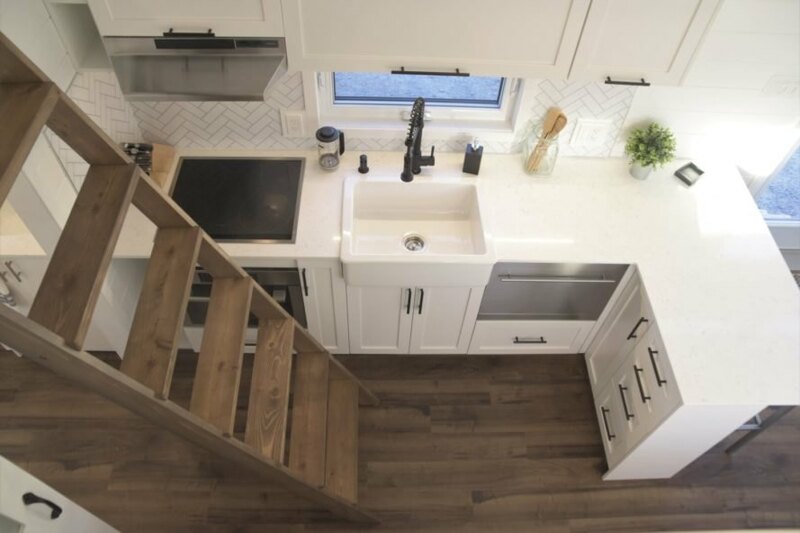 Along with a full range of appliances, there is plenty of storage space with a tall pull-out pantry, tons of cabinets and drawers, A white quartz countertop with space doubles as a kitchen prep space and dining table or work surface with three bar stools. LED backlighting was installed in order to dim the lights when watching TV in the living room or working. 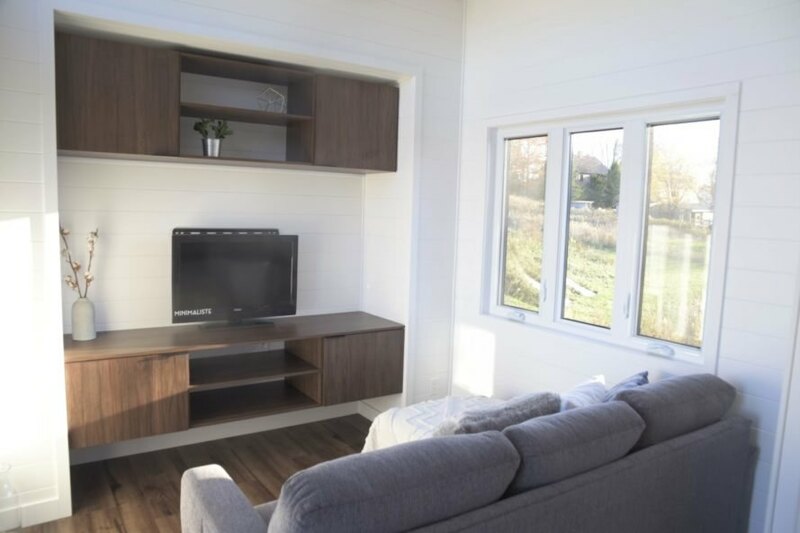 To create a comfortable interior temperature throughout the year, the home was installed with a LUNOS heat recovery air exchanger and two ceiling fans to provide air circulation throughout the home. An abundance of windows throughout the home flood the interior with natural light, which also reduces the home’s energy use. The two-tone exterior is comprised of cedar planks treated with the Shou Sugi Ban technique. 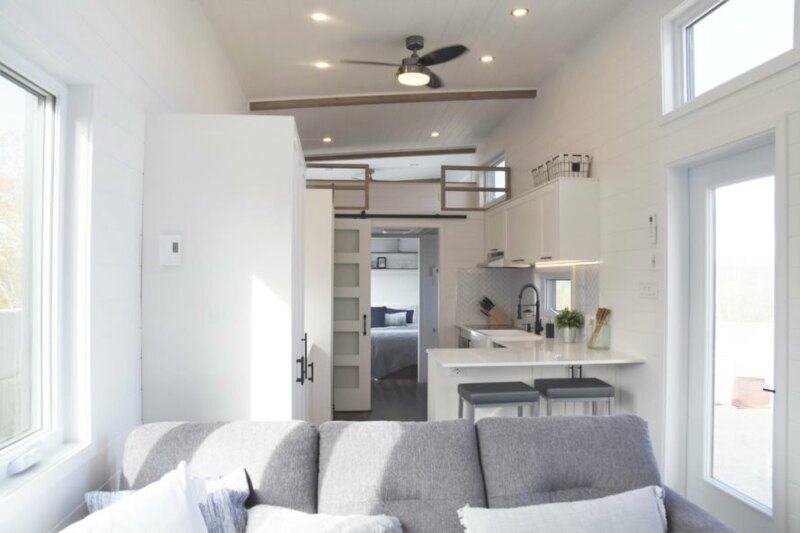 The Magnolia Tiny Home was designed by Minimaliste Houses. 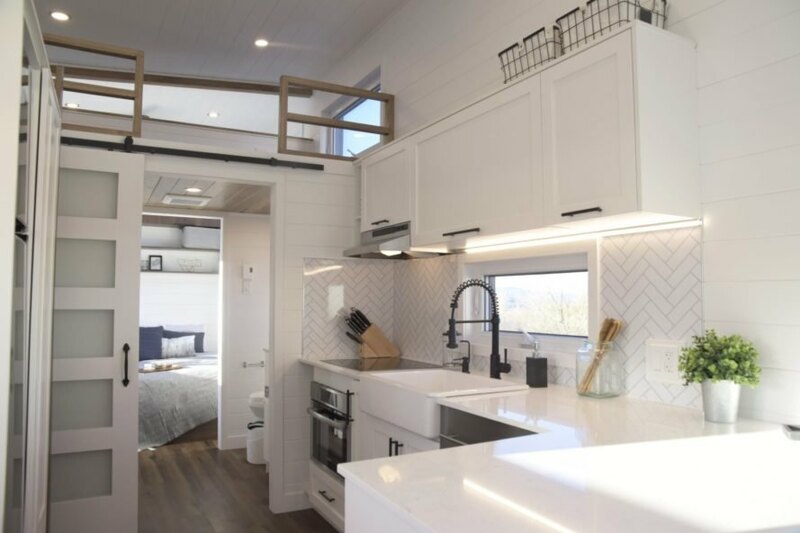 The tiny home was designed to withstand extreme Canadian weathers. The all-white interior gives the home a fresh, modern aesthetic. The living room is furnished with a simple sofa and entertainment center. Two large ceiling fans were installed to disperse the warm and cold air. The kitchen is fully equipped. A white quartz countertop doubles as a preparation area and dining space. The home's high ceilings provide plenty of space. At the clients' request, the main bedroom is located on the second floor. 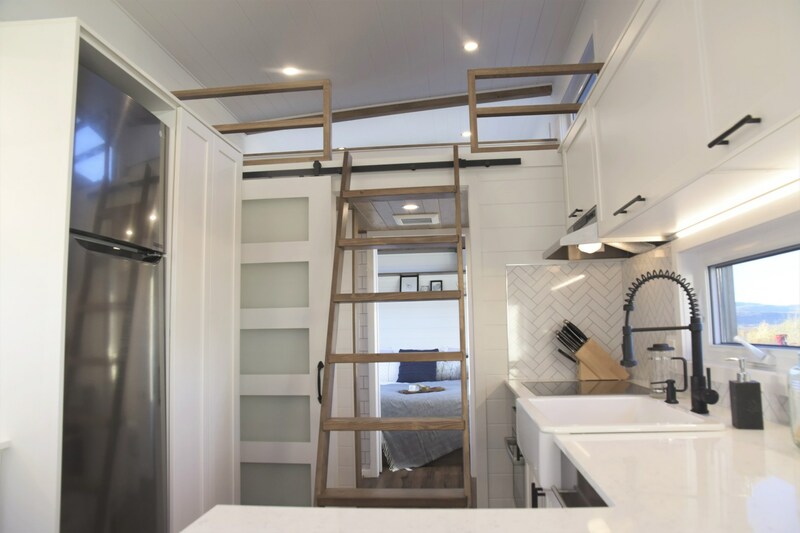 A wooden ladder leads up to the sleeping loft. This space can be used as a guest room or for storage. 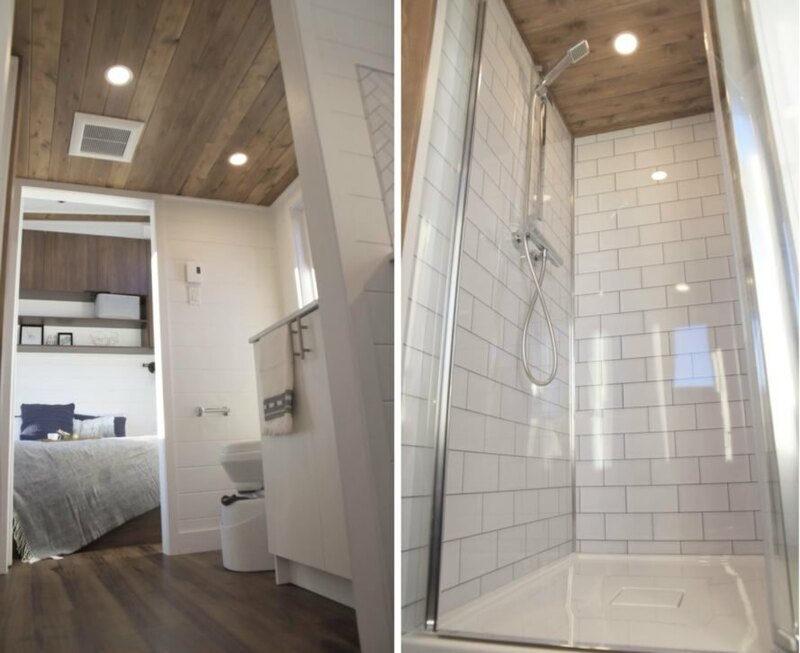 The bathroom is surprisingly spacious for a tiny home. 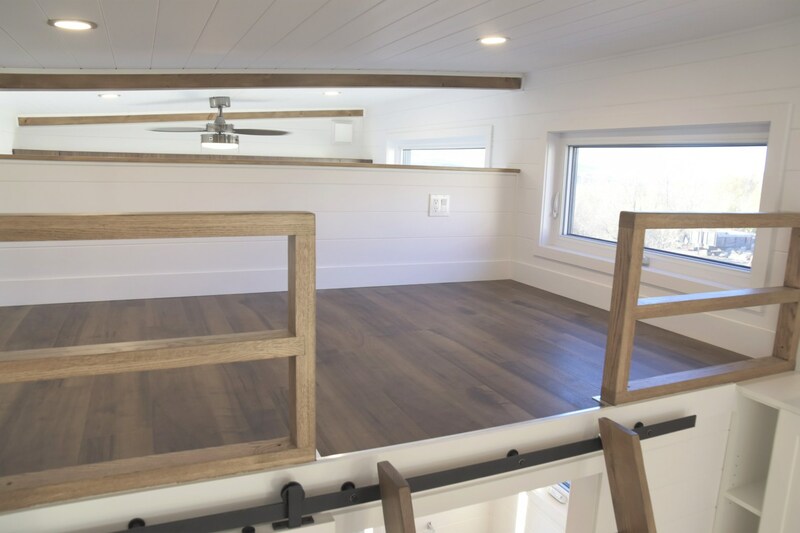 The sleeping area is incredibly spacious for a tiny home. Windows flood the space with natural light. A farmhouse kitchen was installed in the space. The home features plenty of windows to provide the home with optimal natural light.